Improvements in LED lighting coming? Looks pretty promising. I haven’t blogged about alternative lighting in a while, but I remain very fascinated about the potential for LED lighting. I have two LED bulbs right now, and as cool as they are (figuratively and literally) they suffer from the main complaints against LEDs right now — they are quite dim (albeitly by design in these particular bulb’s case) and they are very unidirectional and suitable only for spot lighting applications. 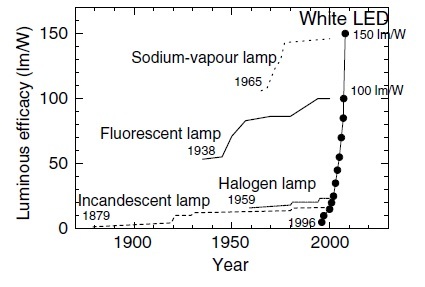 Here’s the latest news in LEDs and looks to be quite ambitious and very interesting. I’m looking forward to being able to replace all my residential lighting with crazy long-lasting and cheap-to-run LEDs. Researchers from the Nichia Corporation in Tokushima, Japan, have set an ambitious goal: to develop a white LED that can replace every interior and exterior light bulb currently used in homes and offices. The properties of their latest white LED – a luminous flux of 1913 lumens and a luminous efficacy of 135 lumens per watt at 1 amp – enable it to emit more light than a typical 20-watt fluorescent bulb, as well as more light for a given amount of power. With these improvements, the researchers say that the new LED can replace traditional fluorescent bulbs for all general lighting applications, and also be used for automobile headlights and LCD backlighting.